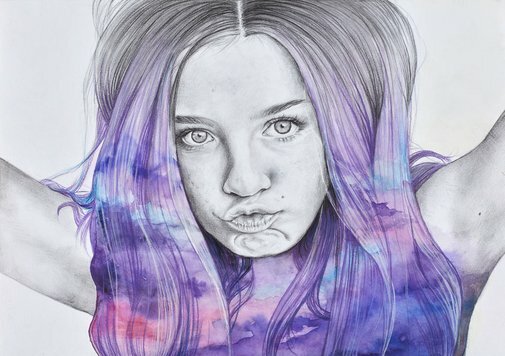 I have drawn my little sister Gracie. With such a small age gap between us, we have always shared everything, which was the subject of many arguments when we were younger. But as we have grown up it has led to a bond that is incredibly special. Gracie is charismatic in a way that you can’t help but like her and she says things that are so completely unfiltered, sporadic and wild, you can’t help but laugh. Her confidence to be extravagant and comfortable with herself has always inspired me. I’ve tried to capture this – her comicality, spontaneity and charm.